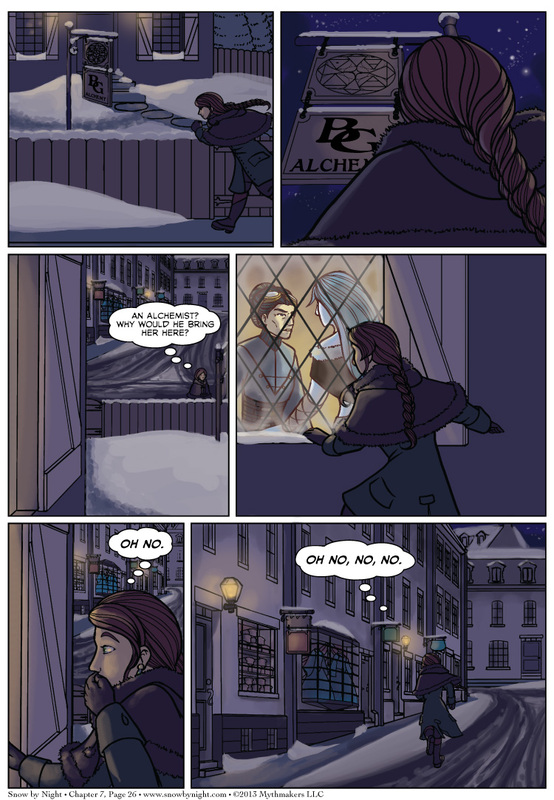 Mathilde’s curiosity drives her to peek into the window of Bertrande’s laboratory on Chapter 7 Page 26. She does not like what she sees. To see a preview of our final page of Chapter 7, please vote for Snow by Night on Top Web Comics. Snow by Night has been invited to join Reverie Comics. Brittany and I are honored to join the likes of Amya, Earthsong, Everblue, Toilet Genie, and Valkyrie Squadron. We’ve added the Reverie Comics link button to our sidebar so please check out those other fine comics. And speaking of other fine comics, the Spider Forest comic of the week is Cetiya, a cyberpunk serial. Give it a read! I’m working my way through the archives now. Also… where are my shades. Ah, here we are. Something tells me the alchemist is about to… chill out. Blaise is going to be ticked! And Jassart is probably going to need a new nose. Marker! Well done all! Snow cones for everyone!